Asylum has won the award for Outstanding Visual Effects in a Video Game Trailer for Halo 3: ODST, The Life at last night’s 8th Annual VES Awards. The Visual Effects Society‘s annual event recognises work in twenty categories of film, animation, television, commercials and video games. 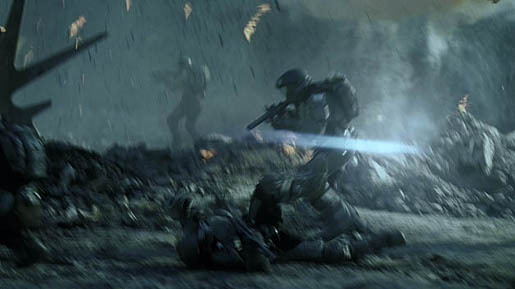 The dramatic live-action short portrays the story of Tarkov, an ODST (Orbital Drop Shock Trooper). From inspiration as a young man Tarkov evolves through his training and harrowing battle experience with the band of elite soldiers against hostile enemies to become a seasoned and deadly warrior. The trailer weaves sophisticated environment and character enhancements and atmospherics with feature film quality particle explosions, plasma weapons fire, CG drop-pods and futuristic Banshee War Planes. The Life trailer was developed at T.A.G., San Francisco, by executive creative directors Scott Duchon and John Patroulis, art director Aramis Israel, copywriter Rick Herrera, agency executive producer Hannah Murray and agency producer Joyce Chen. Filming was shot by director Rupert Sanders via MJZ with executive producer Eric Stern, production supervisors Adriana Cebada Mora and Melinda Szepesi, assistant production supervisor Courtney Nolen, associate producer David Lethem, producers Laurie Boccaccio, Eszter Repassy, director of photography Greig Fraser. Post production was carried out at Asylum by VFX supervisor/lead compositor Rob Moggach, executive producer Michael Pardee, producer Ryan Meredith, coordinator Emily Avoujageli, bidding producer Michael Hanley, compositors Mark Renton, Caitlin Content, Steve Muangman, Miles Essmiller, Rob Trent, Tim Davies, Jonny Hicks, John Stewart, John Weckworth, Brad Scott, smoke artist Alex Gomez, lead modeler Greg Stuhl, modeler Toshihiro Sakamaki, lead animator Michael Warner, animator Samir Lyons, texture artists John Hart, Ryan Reeb, trackers Tom Stanton, Michael Lori, lighters Sean Comly, Aaron Vest, Michael Comly, effects animator/lighter Yurichiro Wamashita, effects animator David Schoneveld, lead Roto artist Elissa Bello, Roto artists Hugo Dominuez, Laura Murillo, Daniel Linger, Bethany Pederson, Jason Bidwell, Stephanie Ide, Scott Baxter, Midori Witsken, Mark Duckworth, Zac Chowdhury, Huey Carroll, wire removalist Bethany Pederson, lead matte painter Tim Clark, designer Simon Cassels and Aaron Benoit, CG supervisor Jens Zalzala. Editor was Eric Zumbrennen at Final Cut with assistant editor Jacob Kuehl, executive producer Saima Awan and post producer Kelly Garcia. Colorist was Mark Gethin at Moving Picture Company. Original music was composed at Human Worldwide, with music producer Mike Jurasits, sound designer Brian Emrich at Trinitite Studios. Sound was mixed by Loren Silber at Lime Studios.